Why is there a requirement for permanent marking equipment? What is the advantage of the Telesis equipment over more traditional methods such as hand stamps, vibro etch pens or printed labels? What is the difference between Pinstamp® and Laser? How do the TeleScribe® Scribe Markers fit into this? What types of material can you mark with which Telesis machine? 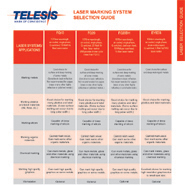 What different types of laser marker do Telesis sell and what do each type mark? What are the particular features of the new patented FQD100 dual beam laser marker? How does the FQ2H laser system work? Does Telesis offer 'Through The Lens Camera' Technology? Are the machines hand held, bench mounted or integrateable? What are the features of the new 'Nomad' Hand Held Marking System? Do the Telesis machines allow for marking curved surfaces? Are the Telesis machines suitable for chassis marking and for marking the labels required by Trailer Type Approval Regulations? Can the Telesis machines be used for security marking to protect property? How is the information as to what to mark and where given to the machine? What are the particular features of the new TMC600 Controller? How are these Controllers protected in a dirty or dusty environment? Can the machines be used to mark the Company Logo? What are the relative costs? Does a ‘Marking System’ (and the above prices) include the Controller? If I purchase a Telesis Marking System, will I receive some initial training? Are the machines ISO9001 compliant? In many processes and industries, there is a need for the permanent marking of a part number, serial number, barcode, 2D data matrix code or QR code, or other product information. This should in practice be impossible to remove – either deliberately or by accident. This can be required by law, because of safety regulations or accreditation, by the internal rules of the industry concerned or it can just make good business and common sense to do so. Hand stamps are difficult and dangerous to use and they can easily cause injury. Vibro etch pens provide a poor quality mark and can cause ‘Vibration White Finger’. Even with strong adhesive, labels are not permanent – if lost, product traceability is also lost. Pinstamp® is the Telesis trademark name for Dot Peen Marking which marks by indenting a surface with a series of small dots to create alphanumeric - readable characters. Laser Marking is a modern, faster technology which uses a laser beam to mark information onto (annealing) or into (engraving) the surface being marked. Generally, laser marking is used where surface indentation is not acceptable (one example is medical instruments where any indentation could harbour bacteria) or where a higher processing speed will bring a significant advantage (shorter cycle time), and where a very high quality, aesthetic contrast mark is required. These are machines that mark by ‘scribing’ the surface using a carbide or diamond pin. They are used where low noise marking is required and are an established method of VIN (Vehicle Identification Number) marking. Pinstamps® and Telescribes® are essentially metal marking machines, although they will mark softer materials also. These include Alloys, Brass, Copper, Aluminium, Castings, Raw Materials etc. Lasers can mark a wide variety of materials, as below. The C Series lasers are CO2 lasers which mark organic materials such as glass, wood, leather and rubber. Some plastics can also be marked by them, but the marking will be an engraved marking with no colour change. The F Series lasers are fibre lasers which can mark a host of materials, predominantly metals and some plastics. The E Series are the most versatile and cost effective lasers offering high quality marking of a wide variety of materials including metals and plastics. The UV laser is able to mark certain other materials including plastics and silicon materials (without the need of additives) and glass with drastically reduced risk of microfracture. An excellent beam quality makes it suitable for micro marking applications such as electronics, circuit boards and microchips in addition to solar panels and precise medical marking applications. The system has the ability to mark in two separate fields (larger marking area) with flexibility of independent control of each marking head, which allows either for simultaneous marking with two separate beams, or for instance marking with one beam and use of the second beam for a cleaning pass. This allows for marking which can be both deeper and faster than single galvo lasers. It is also possible to offer a custom version of the laser – so for instance where a 30 Watt and a 20 Watt mark are required, the system can be configured accordingly, to requirement. The FQ2H (Fibre Q-Switched 2 Heads) allows the use of multiple lasing heads from a single controller. The laser heads are independent and can be used in the same cell or in different cells. You can mark two different products separately and/or mark one product in two different locations. The wattages on the fibre laser heads can be mixed and matched from 10W up to 50W heads. In addition the laser can be purchased with one head and at a later date the second head can be added at a very attractive price. Does Telesis offer ‘Through The Lens Camera’ Technology? Telesis offers this FOC, either in the UK or for specialist applications, at the head office in the US. Telesis recommends that sample marking should always be carried out before a laser is offered so that the most suitable system for the application can be quoted. The Pinstamp® range contains both hand held and bench mounted – they can also be a combination of the two (hand held and bench mounted) – all of which may be integrated. The lasers, for safety reasons, must be contained in a specific class1 enclosure - Telesis offer both standard and custom versions. The 'Nomad' is a fully portable, rechargeable, battery-powered hand held marking system. With an 8 hour battery shift life and marking up to 0.3mm depth, it offers both portability and durability, and is lighter and easier to carry than the Carry Case versions of our hand held markers. The Pinstamp® range uses the floating pin technology, which enables marking around a curvature due to the pin throw. Should the marking be required around the full diameter, then rotary devices are available as both standard and custom. Telesis have supplied various Trailer manufacturers for VIN and VIN plate marking. Further details can be supplied upon request. Yes, Telesis has sold portable, battery operated, versions of its hand held machines in heavy duty carrying cases to local police forces and councils to assist with their property marking initiatives. An initial investment in a machine costs more than methods such as UV pens but the resulting mark is permanent and impossible to remove without leaving obvious evidence of tampering, which acts as a deterrent to would-be thieves as well as assisting in the return of stolen property to its rightful owner. With suitable settings, even items like mobile phones and tablets can be safely marked. Generally for the Pinstamp® and TeleScribe® ranges this is done by means of a Telesis Controller which is fully self-contained with its own menu system, removing the need for a PC to work the marking machine. Where a customer prefers to work through a PC, the Telesis Merlin® III Visual Design Software can be supplied. This software provides increased memory capacity and greater control of what is being marked. A Telesis Laser will always require a PC or laptop, running the Telesis Merlin® II LS Laser Software. The new TMC600 Controller, running the Merlin® Touch PS Software, provides a touch screen user interface for operating the marking system, suiting the personal preference of users who find it more user friendly, and giving a graphical interface which makes pattern design and marking quick and easy. All Telesis control units are built for industrial environments. However for extreme conditions, Telesis offer an IP55 rated Nema controller and for integrated solutions we sell a panel mounted version for mounting in industrial enclosures or in a line-side cabinet. The entry level Pinstamp® Marking System (from the BenchMark® Range) is priced at just under £3,000. An entry level laser will generally be priced at £10,000 or more and will involve other purchase considerations such as a safe working Class 1 enclosure, a PC, and possibly fume extraction. Package prices for both Pinstamp and full laser marking systems can be supplied on request. Yes, when a ‘system’ is quoted this includes the marking head and the controller – everything which is needed to start running the system and marking. In the event that a loan system is needed, this can be supplied. Telesis understands that in many cases the machine supplied is 100% vital to the running of the customer’s production. This is always covered in the initial quotation. Telesis regards it as very important to get the customer properly set up and using the machine in the optimum way from the outset. Yes – full installation and operation manuals are supplied on CD with each new system. Various other support is also available to be downloaded from the website www.telesis.com. Yes – our manufacturing company in the US holds an ISO9001 Quality Certificate.